This PDF 1.4 document has been generated by Writer / OpenOffice 4.1.1, and has been sent on pdf-archive.com on 20/03/2015 at 20:12, from IP address 174.106.x.x. The current document download page has been viewed 432 times. File size: 80 KB (4 pages). uncover the truth behind the mysterious planet that has suddenly appeared in the stars. will not be added to the rankings nor will they gain victory points for their Alliance. put away your terrain and put your tables back. • Players should have fun and resolve disputes fairly. • Armies follow the rules in the Warhammer 40,000 Rulebook and their respective army book. points, allies and Lords of Wars may be included. Formations and Forge World supplements are allowed. will become available at 1350 points. to week. You are not locked into the same list and may make changes from game to game. unit types are highly discouraged as they take away from the fun and friendly aspect of the league. Models DO NOT have to be painted to take part in the league. scenario and battlefield rules will be in place for each Planet to help determine victory conditions. 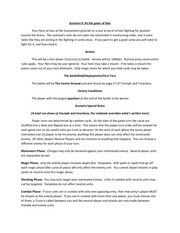 Additional points can be awarded if players battle against “Know Thy Enemy” opponents. It is inevitable that in times of war, unlikely alliances are formed and lines are drawn in the sand. belong to by the time the league begins on April 19th. players choose to do battle with these opponents they will gain 3 pts for a victory and 2 pts for a loss! Marines and Daemons will find themselves in the same Alliance). course of the league as the armies tap into the resources and strategic strength of their new world. Players will need to make a custom hero miniature to represent their evolving hero on the battlefield! abilities your Custom Hero has and it should be clearly marked on your army list. miniatures and prizes will be awarded accordingly! will begin the league as a Base Hero and will follow these guidelines until their first trait is earned. Hero may spend experience to purchase traits and advance to the next tier of Hero. 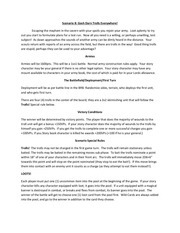 • A Base Hero must begin each game as part of a unit. 1 additional attack (included in statline). course of the game make note of it when you submit your game results. accessible due to a lucky roll on the Wound Chart. War is fickle like that. will be posted with the first wave of Hero traits at the end of Week 2.
crushing defeat. Full rules to come once the league has begun. 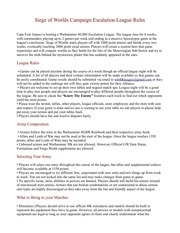 any rules questions or suggestions, feel free to email them to wh40kleague@gmail.com. Thank you for taking part in this exciting Warhammer 40k event at Cape Fear Games! This file has been shared by a user of PDF Archive. Document ID: 00216361.